It's been three weeks since my last anime review roundup. It's not my fault that there has been a veritable drought of new anime being released in the UK. Just like the real drought though, there's plenty of metaphorical wet stuff around, as each week has seen the re-release of some complete season collections, most recently a K-ON! Collected Season 1 boxset. Please buy this, as it will make the acquisition of season 2 more likely. The new stuff has been waiting for May's arrival to suddenly pounce. And I was fully expecting the Mayday Bank Holiday to herald a mental breakdown for yours truly. A few weeks ago, it looked as if there would be six new anime titles released to the UK market, six reviews for me to write. Alas delays have struck again, and now it seems that only one new title is coming out today, although on some forums it's been reported to have been delayed until next week. Nevertheless I have reviewed it, and I've gone into the back catalogue as well to find something to opine about. My breakdown has now been delayed until the 28th of May, which is another nightmare week for anime bus metaphors. Newswise, there has been plenty going on, with lots of tantalising hints for the forthcoming London MCM Expo. Kaze are going to bring forth the new Berserk movies to the UK, the Roberta's Blood Trail Black Lagoon OVAs are now expected in 2013, waiting on an English dub, and most recently Manga Entertainment have announced the Fullmetal Alchemist Brotherhood OVAs on Blu-ray and DVD for October. Netflix UK has added a whole bunch of new anime to its service, including some Nozomi Entertainment titles that have never been released here on DVD. Across the pond, as is typical in my life, NISA announced a deluxe Blu-ray DVD combo for Usagi Drop just as I placed the order for the Region 4 DVD. No matter, as the NISA edition will be so vast, overloaded with physical extras and packaging, that customs would kill me. And Anime News Network published a news story about Media Blasters that caused such an uproar that it will need the Leveson Enquiry to unravel. Speaking of rescue and re-release, I got to revisit another cyberpunk classic for my second and final anime review of the week. 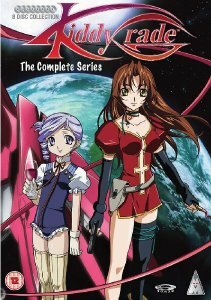 The Kiddy Grade: Complete Series Collection is now out in the UK, several years after MVM lost the licence, and the single volumes were deleted. Set in the distant future, it follows a pair of cybernetically enhanced agents named Éclair and Lumiere as they go about their missions settling trade disputes in the galaxy. The Phantom Menace should have been so exciting. There's more to this Gonzo animation than just that, as there are conspiracies and mysteries which permeate the story. Deep plans are afoot that will shake the galaxy to the core, and Éclair's hidden past will determine just what happens. Stepping away from the anime for a minute, there's also a live action adaptation of a Ken Ishikawa manga for you to appreciate. It follows the heir to a Yakuza Empire, who comes back to Japan to find his father assassinated, and his position usurped. What more is there for a gangster to do than to find revenge, and if he has to have a Vulcan cannon embedded into his arm, a rocket launcher replacing his knee, then so be it. This visual insanity of a movie comes from the same people who made Versus and Meatball Machine, and I got a look at the Blu-ray of Yakuza Weapon last week. If you're still in the mood for a little live action adaptation of comic book material, then I also managed to look at something from a little closer to home. 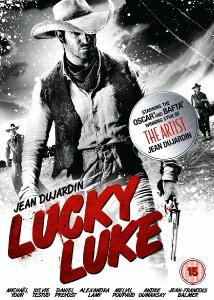 I grew up with the Lucky Luke comic books, and to my surprise, the Lucky Luke movie isn't even the first such movie created from it. It isn't even the first adaptation to have Oscar Winner Jean Dujardin in the cast, but it is the first to have Jean Dujardin in the title role. How can you get a faithful live action version of a comic book where the hero's horse is a mean chess player? Click on my review to find out. 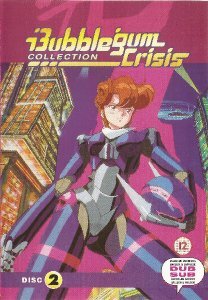 If you want MVM's Bubblegum Crisis: Volume 2, you'll have to be just as diligent and patient as I in sniffing out a second hand copy, but it is worth it. No such problems with the Kiddy Grade: Complete Series Collection, which should be out today, but according to a couple of forum posts around the net, has been delayed until 14th May. Nevertheless, MVM's online store Anime Online has got copies in stock now, if you want it badly enough. Bounty Films release Yakuza Weapon on Blu-ray and DVD today, while Arrow Films' release of Lucky Luke has already happened.